The World Tourism Organization (UNWTO) organized the 7th UNWTO Global Summit on Urban Tourism: A 2030 Vision for Urban Tourism, on 16-19 September, in Seoul, Republic of Korea, jointly with the Seoul Metropolitan Government and supported by the Ministry of Culture, Sports and Tourism of the Republic of Korea, the Korea Tourism Organization and the Seoul Tourism Organization. 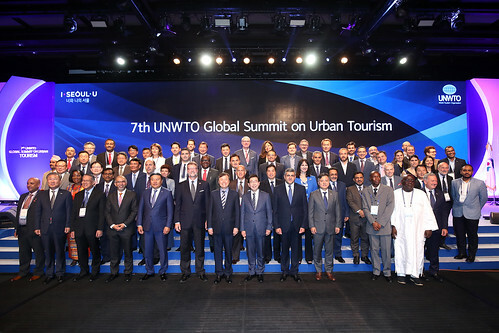 The Summit provided a unique platform to discuss the key issues shaping the future of urban tourism in the context of the 2030 Urban Agenda. It brought together high-level representatives from National Tourism Administrations, city authorities and related stakeholders, serving as a platform to exchange experiences and expertise and set a shared vision on urban tourism that embraces innovation, digital transformation and sustainability. Click here for the extracted Executive Summary of this publication. JATA Tourism EXPO Japan Forum 2016 in collaboration with UNWTO will take place on Thursday, September 22 and Friday, September 23 at Tokyo Big Sight in Tokyo. The Global Tourism Forum will feature keynote speeches by Dr. Taleb Rifai, Secretary-General of the UNWTO and Mr. David Scowsill, president and CEO of the WTTC. The theme of the 2016 forum is sustainable tourism with a particular focus on traditional life and culture found in local communities. Japan is largely a hi-tech industry-based nation. Its tourism policy seeks to make Japan a leading nation in tourism by placing its history, culture, and local resources front and center. The theme of the panel discussion for the keynote symposium will be "New Opportunities for Sustainable Destinations – Japan and the World." For more details, please refer here. The keynote symposium will be moderated by Professor Yoshiaki Hompo: Specially-appointed Professor of Tokyo Metropolitan University and Tokyo Institute of Technology, Special advisor to Japan Tourism Agency, Chief of the Regional Support Office for the Asia and the Pacific and the member of the World Committee on Tourism Ethics. Traditional Japanese cuisine was inscribed on UNESCO´s Intangible Cultural Heritage List in 2013. Japan currently offers a wide range of gastronomic experiences in many cities across Japan. However, local governments and communities have not yet embraced gastronomy tourism as a potential resource to revitalize regional economies. Against this background, this symposium will put ¨Gastronomy Tourism¨ in the spotlight. Mr. Naoki Iimori, President & Chief Executive Officer, Fukuchiyo Shuzo Co., Ltd. The Domestic Tourism Symposium will be moderated by Mr. Masato Ogawa, Executive Vice President, ANA Strategic Research Institute Co., Ltd.
We are pleased to inform that the Workshop on Mekong River-based Tourism Development will be held in Da Nang City, Viet Nam on 19th November 2015, in the framework of ASEAN – UNWTO tourism cooperation on river-based tourism development in ASEAN region. This is coordinated by Vietnam National Administration of Tourism (VNAT) – Ministry of Culture, Sports and Tourism who will host the Workshop. The key findings of the on-going UNWTO study on the Mekong River-based Tourism Product Development will be presented by the UNWTO consultant. It will allow participants to exchange ideas and experiences on current Mekong river-based tourism issues. Furthermore, it will also give the opportunity to share best practices of developing sustainable river-based tourism products and will include recommendations for policies and further steps. We are pleased to inform you that at the gracious invitation of the People’s Government of Guilin of China, the World Tourism Organisation (UNWTO) and the Pacific Asia Travel Association (PATA) are organising the 9th UNWTO/PATA Forum on Tourism Trends and Outlook scheduled to be held in Guilin, China from 19-21 October 2015. This year´s forum is organised under the theme of "Tourism and the Experience Economy." The Guilin Forum provides an annual Pan-Asia-Pacific platform for policy makers, senior officials, researchers and industry representatives to take stock of global & regional trends and to better understand their potential impacts on tourism. The event, under the joint umbrella of the UNWTO and PATA, will allow participants to share information, analyse the current tourism situation and map out the next course of action for the future. Yang Haolei, General Director, Guangxi Zhanzhuo General Aviation Co.,Ltd. “UNWTO was shocked to learn of the brutal bomb attacks in Mumbai that claimed innocent lives and wounded many civilians. Our thoughts are with the families of the victims and those injured in the attack. With a gracious support from the Tianjin Municipal Government of China, the 6 day UNWTO training program on Tourism Marketing was successfully held in the beautiful city – Tianjin (one of the four cities under direct jurisdiction of the central Government of China, neighboring Beijing) from 1 to 6 September 2011. The training program as an integral part of the UNWTO initiative for the capacity building of its member states attracted 21 tourism marketing officials from 16 countries in Asia and the Pacific. Through the program, the participants actively exchanged views with the professors on tourism marketing in general and with special emphasis on how to attract Chinese tourists to overseas destinations. Although it is the new endeavor of UNWTO jointly organizes with one of its member countries in the area of training for other members, the idea and the content of the training are welcomed by the participants.